“The Chamber is extremely pleased to offer the Leadership Shenandoah County program in our community. 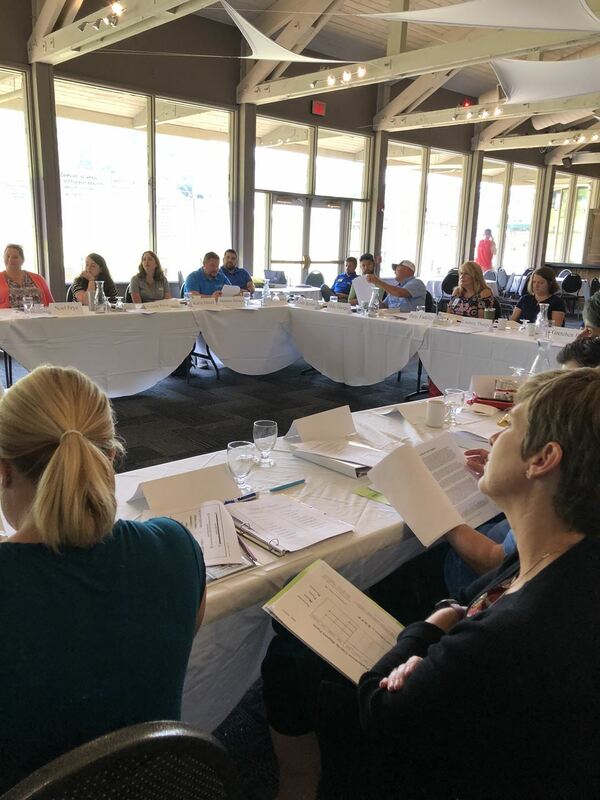 The class is very enthusiastic to learn more about what our County has to offer and we have sessions that will provide a great depth and knowledge into each area,” shared Chris Boies, President of the Chamber and Chair of the Leadership program. Leadership Shenandoah County is an eight-month program with the objective to develop the skills of participants so they will be able to provide the leadership necessary to recognize and address community needs. Participants will gain understanding of the complex issues facing Shenandoah County through educational programs, exposure to community leaders and the structures within which they operate, and through discussions and examination of current issues facing the County. Topics include Leadership, Agriculture/Tourism, Local Government, Education, Public Safety, Health Care, Business/Industry, Non-Profit/Media, and the final session involves group presentations from the cohort of participants. Sessions are led by a combination of community leaders, professional facilitators, and specialists in the respective fields. To develop and foster leadership potential in the community to ensure citizen involvement, community prosperity, and overall community success in Shenandoah County. To develop the skills of participants so they will be able to provide the leadership necessary to address community needs. To enhance an understanding of the complex issues facing Shenandoah County through educational programs, exposure to community leaders and the structures they operate within, and through discussions on current issues facing the County. This is an eight-month program from September through April. Sessions will be held once a month during this timeframe on a Friday and will generally run 8:00-4:30. Lunch and a light breakfast are provided for each session. Topics include Leadership, Agriculture/Tourism, Local Government, Education, Public Safety, Health Care, Business/Industry, Non-Profit/Media, and the final session involves group presentations from the cohort. Sessions are led by a combination of community leaders, professional facilitators, and specialists in the respective fields. Consists of selected business leaders invited by the Chairperson to select the Leadership Shenandoah County participants. Each Director would coordinate and facilitate their respective Session. The Board consists of the Chamber President Elect, Chris Boies; County Administrator, Mary Beth Price; SCPS Superintendent Dr Mark A. Johnston; Chamber Executive Director, Sharon Baroncelli; and representatives from Industry/Business- Greg Hoover with First Bank; NonProfit- Sheila Orndorff with Shenandoah Alliance for Shelter; Healthcare- Niki Wilson with Valley Health; and Media-Mike Gochenour with the Northern Virginia Daily. Days typically begin at 8:00 a.m. and end at 4:30 p.m.
Education –A look at the structure and operation of our public and private educational systems. Includes discussion and interaction relating to education’s role in our economic prosperity. This class requires independent attendance at a Shenandoah County School Board meeting prior to the session. Public Safety – A look at our law enforcement agencies and how they interact. Includes tours of the RSW Regional Jail and County Courthouse. Business/Industry – A look at the diversity of the local business economy including a statistical overview of the county. Includes tours of several area businesses and industries. Communication and our Non-Profit Community – Part of this session visits with the media covering our area and we discover Shenandoah County’s Dept. of Social Services and non-profits in the other half. We will learn the role these entities serve in commerce and our quality of life. Graduation – A special event honoring those who have completed the Leadership Shenandoah County Program.